I let a badly-written sweater pattern steal my knitting mojo for months. 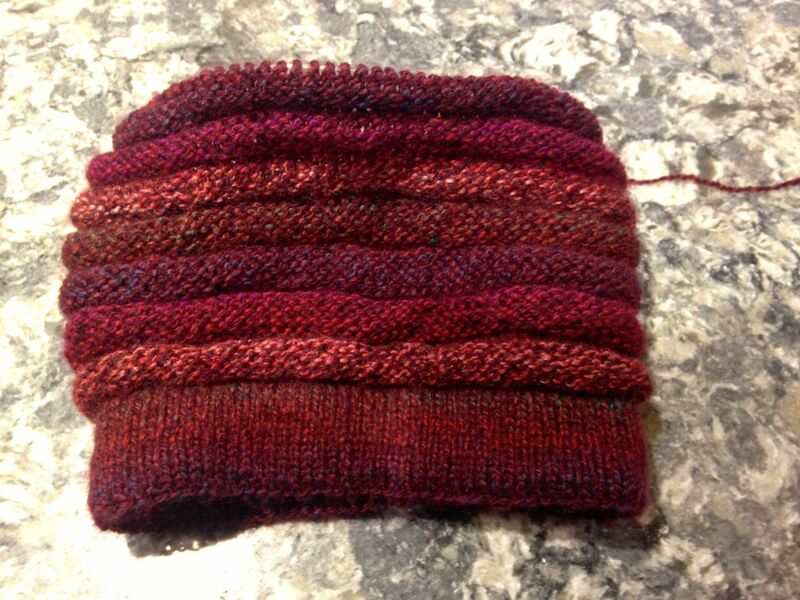 Don't you hate that when a pattern is highly rated by a few (15) people on Ravelry, possibly only the designer's friends, and the instructions are incomprehensible? I don't mind the 5.90 Euros as much as the time wasted. These past few weeks have been so stressful, I need an easy knitting project to help calm me down in the evenings. Wurm, with 12,837 projects on Ravelry, looked like an easy and useful make. The pattern is free and well-written. I stopped by Shuttles, spindles and skeins on the way home last Friday to get 100 g of something DK, non-scratchy, and machine washable. Almost done! I've been super-busy preparing for the talk and workshop next week. I'll just post some pictures of my past two weeks, with very short comments. I'm tweeting more often, especially about science and women in STEM. If that interests you, follow @gspeng. Twitter, and email are the quickest ways to message me if you have a question or comment. Comments left on this blog also get forwarded to my email. I've also joined Instagram as bmgmlax. Instagram allows people to open accounts without verifying their email address. A young man used my personal email address to sign up for Instagram and was quite active on that site. I couldn't get Instagram to delink that account to my email address. Finally, I took control of that account using the "forgot my password" option and then deleted his account. I felt bad about that for about a millisecond. The squatter using my email address and Instagram deserved it. Twitter is is an extension of my professional life. Instagram is for my off-duty life. Waiting for a meeting to start. That's the outdoor patio of the cafeteria. Leaving work the day after the storm that just missed being classified as a blizzard because the high winds and zero visibility did not last 3 continuous hours. Another shot as I left work. 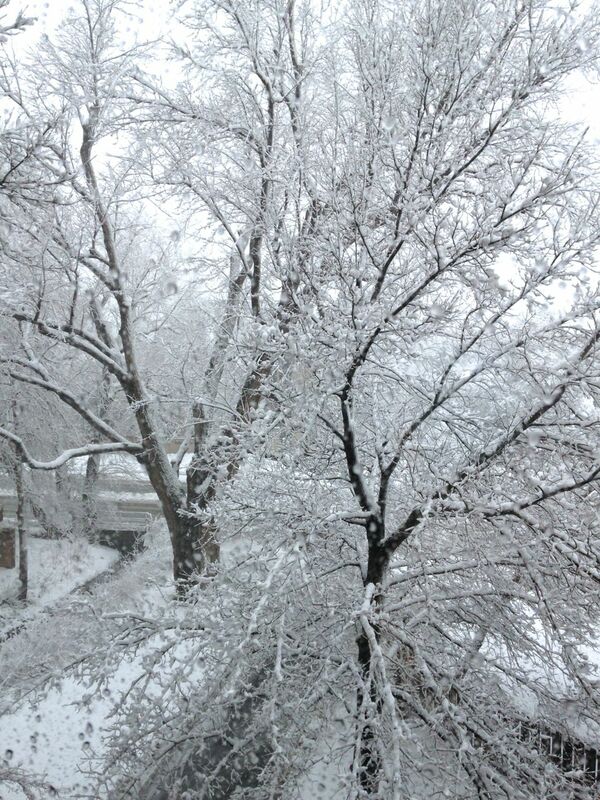 View from my neighbor's window. 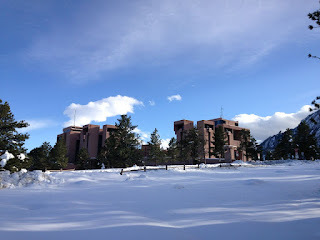 You can see both my current office building up on the mesa top and my former campus tower office. Mariposa for my reading nook. I can see Long's Peak from my kitchen and bedroom windows. 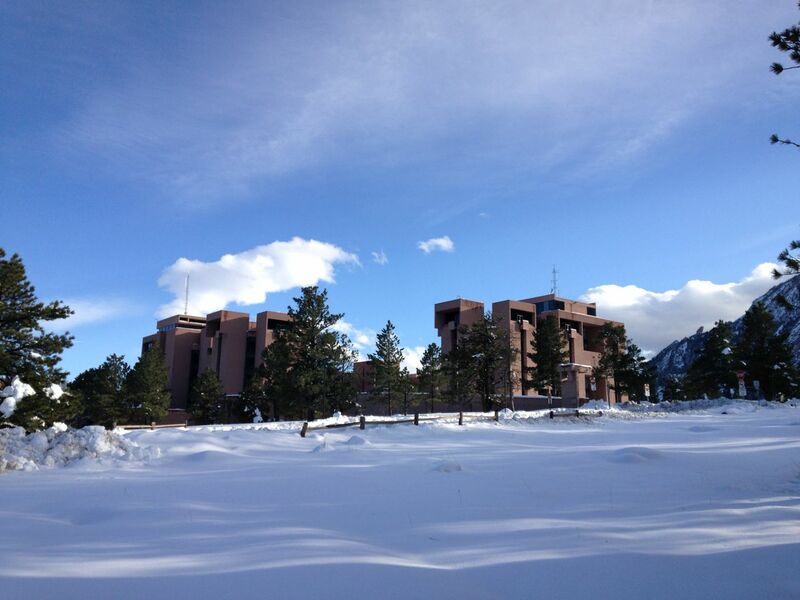 I'm told that I can see Pike's Peak from my office window, but I haven't learned how to recognize the shape yet. 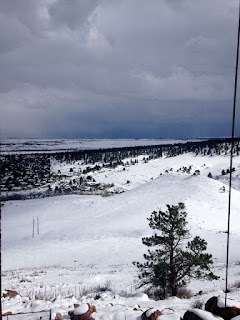 We had ~35 inches of snow in one week (3 storms). 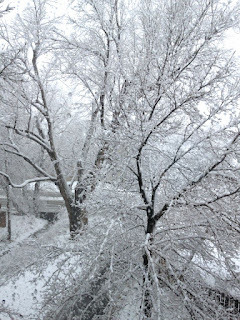 Each snowfall was preceded by half an inch of rain. The town is a soggy and muddy mess. 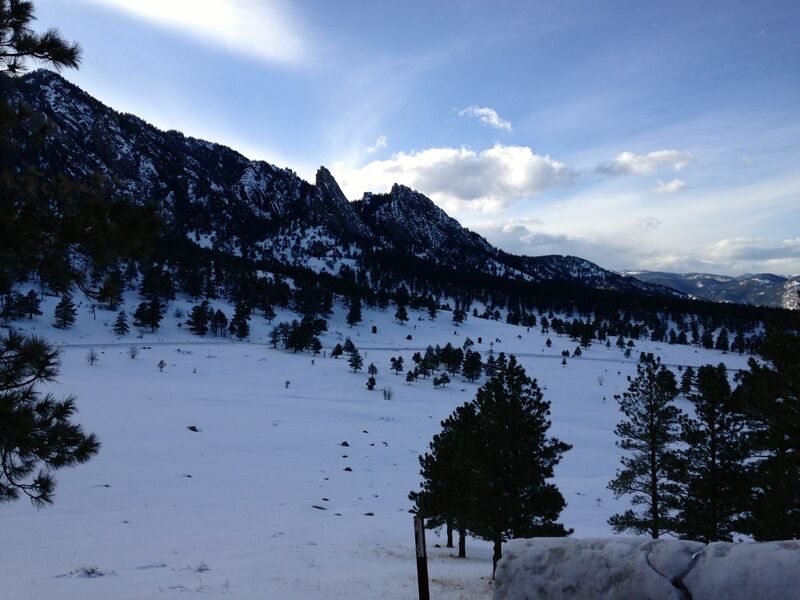 The views are beautiful, but I've been putting in my miles on the treadmill indoors lately. Lab was closed today so I worked from home. I'm reading, writing and testing in preparation for an upcoming talk and workshop, so a day spent testing on my home computer is actually useful. No commute time = time to write the flat-fell seam tutorial I promised to Ms McCall. 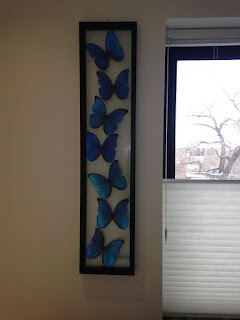 Years ago, I learned this technique from Margaret Islander videos. This was included in both the Shirts, etc! and one of the Galaxy of Sewing Techniques videos, which I watched in VHS back in the day. They are so fantastic, I might ask Santa to buy the full set of DVDs for me. Keep in mind that I forgot the specifics of measurements from the cut edge, but I do remember the technique quite well. I sewed reference lines 5/8" from each cut edge. Pink lines 5/8" from each cut edge. You can fold the bottom layer's edge before or after (as I did here) the first sewing step. Lay the top layer's edge 1/4" to the left of the edge of the bottom layer. Then stitch 1/4" to the left of the top cut edge. If you fold 1/4" over before stitching, then it's hard to see if you have butted the top layer right up against the fold line. 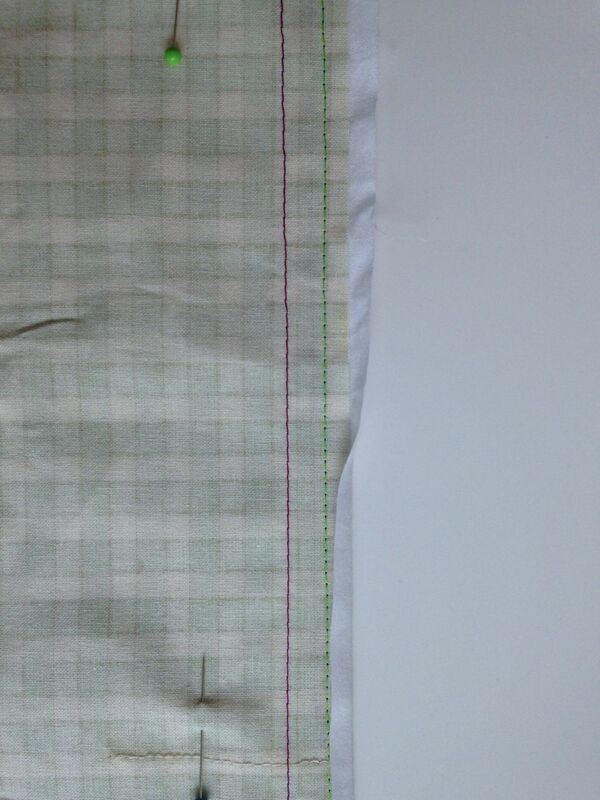 However, then you can sew a scant 1/4" so you catch all three layers (white+green+white). Try both techniques and pick what you prefer. There is no reason why you can't sew one line through two layers, press the fold, and then sew right next to that line through three layers. These lines of stitching won't show on the outside. Lay one layer 1/4" inside other edge, then stitch 1/4" from second edge (green). 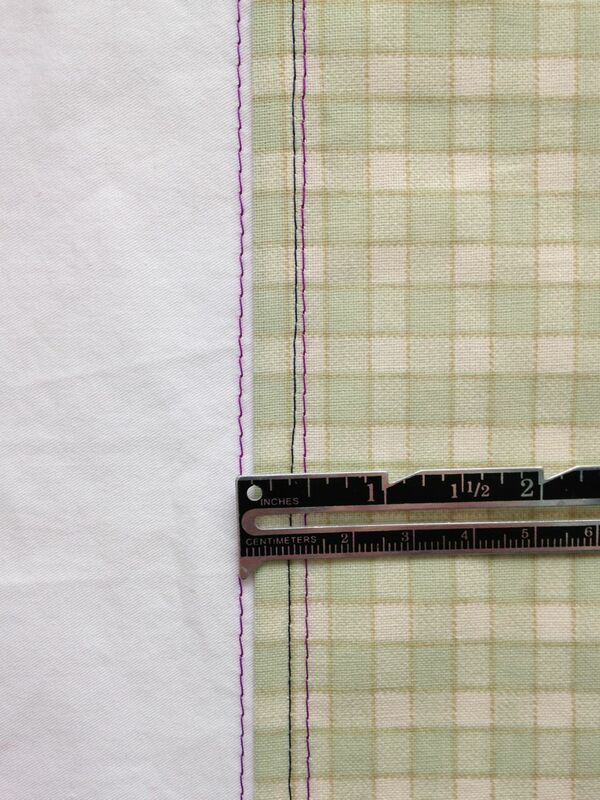 Press together to embed stitching, then carefully press the seam allowance to the side (fell). The bobbin side of the first line of stitching will face up after pressing to the side. Stitch right next to the fold of the white fabric, catching all layers. I stitched from the wrong side, with green thread in the needle and navy thread in the bobbin. On the wrong side, you see both the first row of stitches (navy bobbin thread) and the second row of stitches (green needle thread). Both rows of stitching from the WS. On the right side, you will see the bobbin thread with the folds centered between my 5/8" markings. Second row of stitching from the RS. 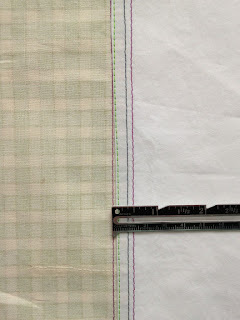 My sample uses medium-weight cottons and produces a fat 1/4" (1/4" plus turn of cloth, TOC) flat-fell seam centered between the 5/8" reference lines. My reference lines ended up 1/2" apart. If you want a centered seam, then keep the seam allowances even between the two pieces you are joining. Make samples because the spacing will depend on the thickness of your fabric (TOC) and how fat you want the seam. For jeans, I would try 3/8" as a starter and adjust from there. 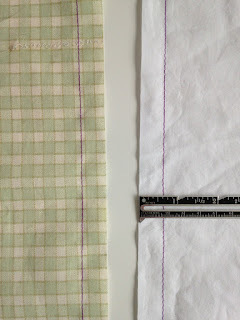 If you want the seam allowance to lay to one side (on a sleeve cap), then trim one seam allowance 1/4" narrower and add it to the other side. 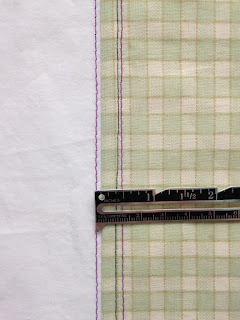 For instance, you may want to trim a shirt body SA to 3/8" and give the sleeve cap a 7/8" SA. Stitch with a 3/8" fold/SA and you will end up with a FF seam pressed against the shirt body. You'll find this easier to do if you gather the sleeve cap with a running stitch and a hand needle first. 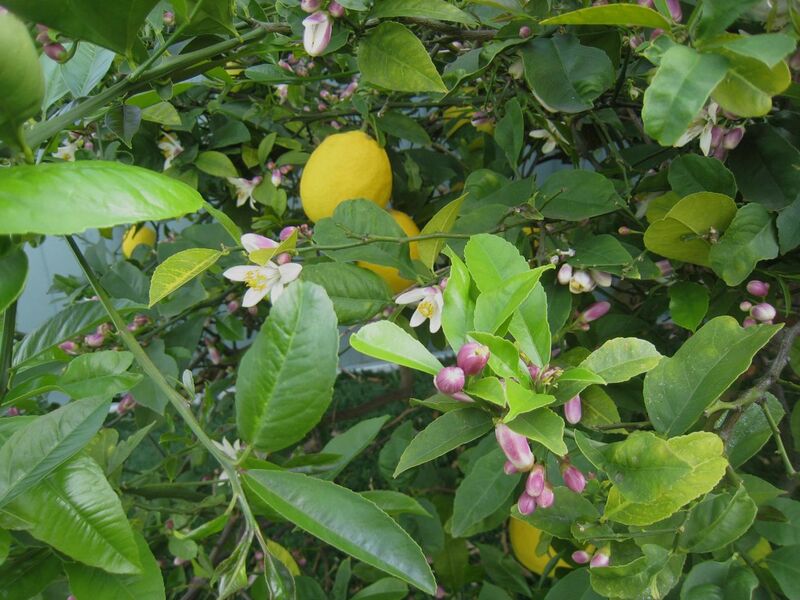 I wish one could smell the lemon flowers through the screen. 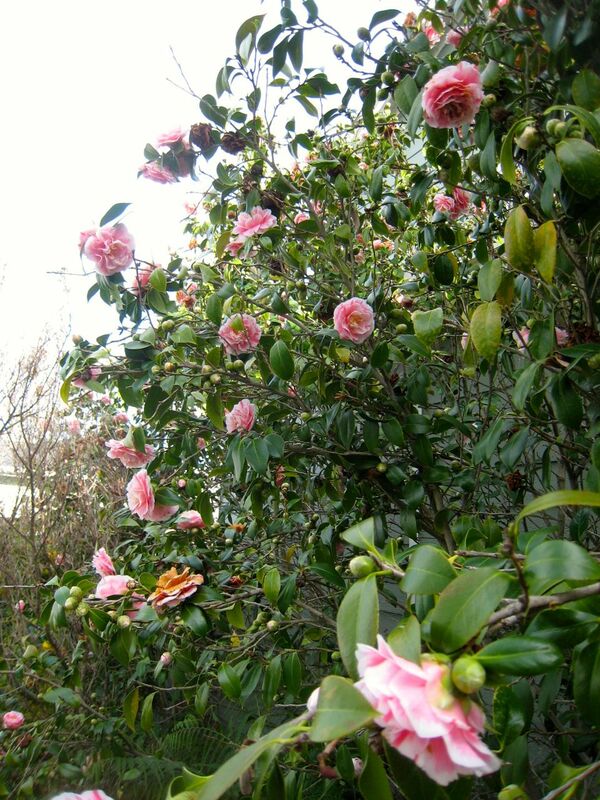 The camellias (in our LA yard) enjoyed their baths this winter. I wish there were more coming, but the Madden-Julian Oscillation makes that unlikely. On the upside, I traveled eastward with the MJO back to Boulder. That's one dramatic front, n'est pas? I have so many things I want to say about groundwater, it won't all happen during #GroundwaterAwarenessWeek. You can go over to LA Observed to read my post, Superbugs? Toilet to tap is safer than surfing. I'll wait until you come back. A couple of weeks ago, the California media ran many stories along the lines of California drought: How will we know when it's over? that focus on rainfall. 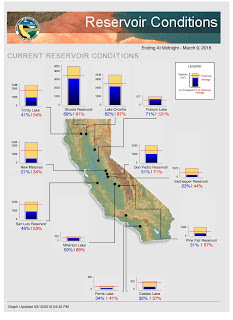 Some stories also included reservoir status with this data visualization from California Water Resources. There's one big problem with all of this. How much of our freshwater can we see? USGS kindly compiled the data for us. We're fixating on the what we can see (rivers, lakes), while there is 100 times more water that we can't see (groundwater). 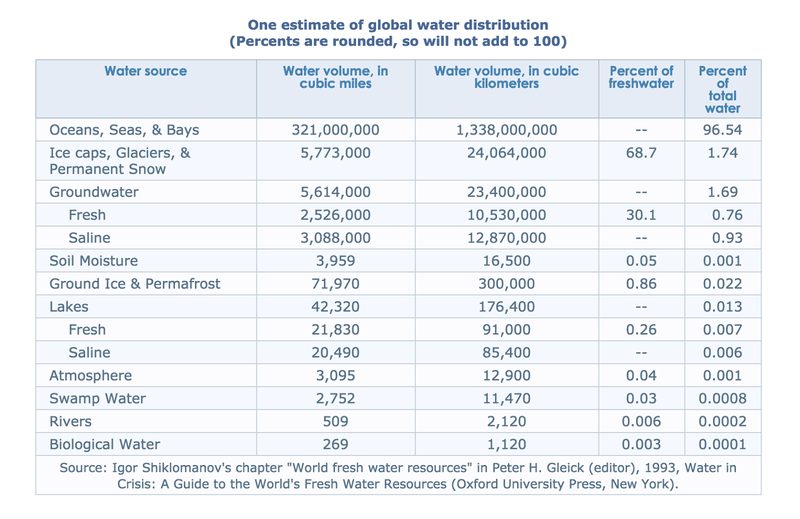 Freshwater lakes hold 0.26% of the world's freshwater compared to 30.1% in the aquifers. Some people might rightly point out that this is a global average. What about developed water in California? That's a valid point. 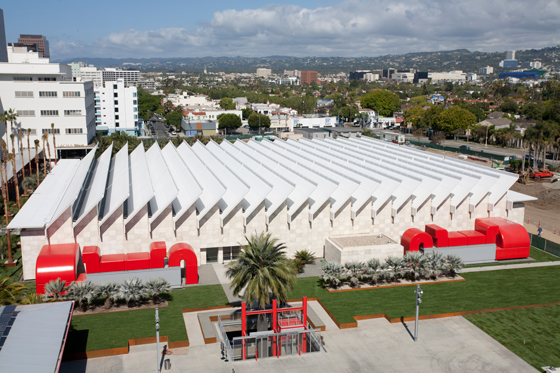 California has more infrastructure to store and move surface water than the global average. 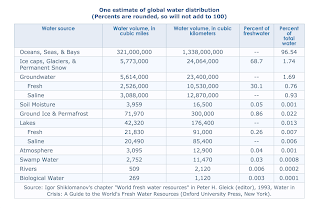 However, groundwater accounts for 40-60% of water used in California. We don't know how much for sure because the farm and golf course lobbies don't want to meter and report how much water they are pumping out of the aquifers that we all share. Most (urban and suburban) Californians get their groundwater through water agencies that do have to report their pumping activities. I wonder what the objectors have to hide? Years ago, they gained control of one of the largest underground water reservoirs in the nation, the Kern Water Bank on the edge of California's Central Valley. This vast holding system—built with public funds in 1999 to help buffer the effects of droughts—stores water from California's aqueducts and the Kern River; it's estimated to be worth more than $180 million on the open market and has allowed the Resnicks to double their acreage of fruits and nuts since 1994, according to the Los Angeles Times. The southern San Joaquin valley is a desert. Storing water above ground would lead to huge evaporative loss, making underground storage the right solution. We built a water storage system and bought water to fill it. But, the current laws allow any land owner above an aquifer to pump the hell out of it. Of course the Resnicks planted ever more permanent crops on their land atop the water bank. They made their billions buying worthless desert land, lobbying government to bring water to them, then selling the water, either literally or embedded into nuts. The Resnicks' court battles are much more interesting than Kim Kardashian's Twitter wars, but you wouldn't know it from media coverage. Read how farmworkers in the San Joaquin Valley had their water privatized. OK, what about climate change? I found this illustrative cartoon in The Impacts of Climate Change on Global Groundwater Resources (Part 3 of 4). We can't do anything about the rain (or lack of it) unless the whole planet decides to emit less CO2. But, we can control how well we capture that rain and store it underground for a sunny day. 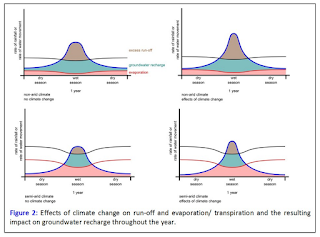 Basically, we need to engineer our environment to move that upper curve upwards to increase groundwater recharge and reduce run-off. We can't build stupidly any longer. Photo from NYT coverage of the FW 2016 Saint Laurent show in Paris. I read about France's law that purports to protect the health of models. Rather than just mandate larger sample sizes (like those that prevailed until recently), the law requires that models have a doctor's note saying that they are a healthy weight. I wondered how that would play out. Would models be less thin this season at the Paris shows? Or would models/agencies just shop for cooperative doctors? We've done the experiment and the data is in. 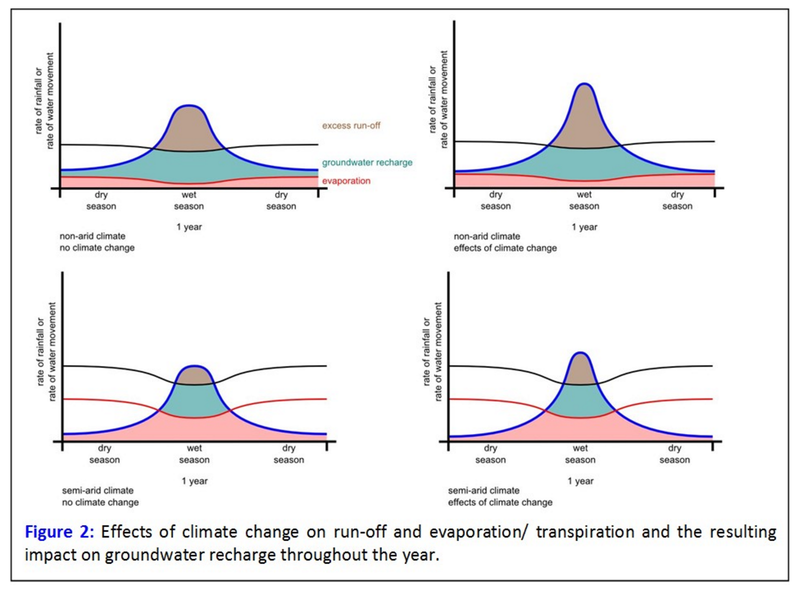 For #GroundwaterAwarenessWeek, I'd like to give a shout-out to Christopher Barry's excellent series, The Impacts of Climate Change on Global Groundwater Resources for EGU Blogs. 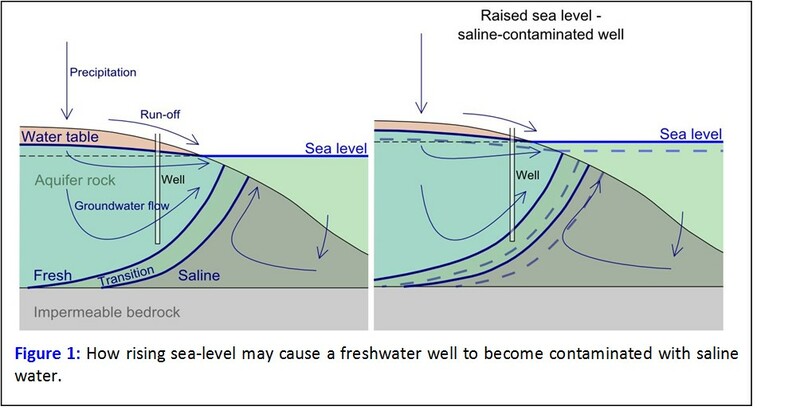 Small oceanic islands are particularly vulnerable to saline intrusion because their freshwater lens by buoyancy and the balance between recharge and outflow. The Ghyben-Herzberg relationship demonstrates, by considering buoyancy, that the freshwater lens will extend to a depth below sea level forty times the height by which it stands proud of sea level. Therefore a small rise in sea level will be cause a decrease in the depth of the freshwater lens by approximately forty times its magnitude. I'd like to point a spotlight at Fiji, which was hit by very hard by Tropical Cyclone Winston in Feb 2016. Most people in Fiji depend on groundwater from shallow wells. Storm surges associated with strong storms exacerbate seawater intrusion. Rising sea levels associated with a warming planet exacerbate seawater intrusion. 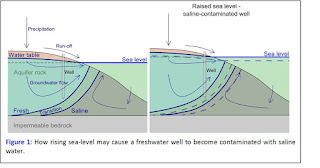 Groundwater pumping at faster than replenishment rates exacerbate seawater intrusion. When I see bottles of Fiji Water, I cringe, thinking about the ecological harm. From Fiji Water: Spin the Bottle in Mother Jones. Fijians drink water carrying typhus if they can't afford to buy bottled water (at similar to US prices) from their own aquifer! Why? Because they can't afford to drill wells as deep as the ones at the bottling plant. Why aren't the Resnicks, who bought Fiji Water in 2004 from Gilmour, spending a small fraction of their advertising budget to drill wells and build pipe networks to provide clean water to Fijians? Oh, right, they are too busy privatizing Californian taxpayer's water in Kern county while buying naming rights to buildings around LA. The corruption in both Fiji and California is just sickening. A statistics blogger, John Cook, explains why ready-to-wear fits so few women. Out of 3,864 contestants, no one was average on all nine factors, and fewer than 40 were close to average on five factors. I want to point out that women were more homogeneous in 1945 Cleveland than they are today. I would guess that the contestants were mainly young women of European descent. Then Cook uses a normal distribution to simulate 3,864 women with 9 independent measurements to illustrate the point I made in Meeting Shams. Body measurements are correlated; that's why RTW pants can be clustered as "curvy", "straight" or "favorite" fits. But it's an interesting exercise and Cook provides his Python code so you can play around with your own simulations. BTW, I'll be giving a talk, Data Thinking Before Data Crunching, at the CISL 2016 Software Engineering Assembly on April 5, 2016. 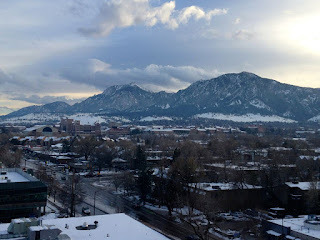 The following day, Mary Haley* and I will be co-teaching an all-day hands-on workshop for analyzing and visualizing spatial and atmospheric datasets with Python and NCL. 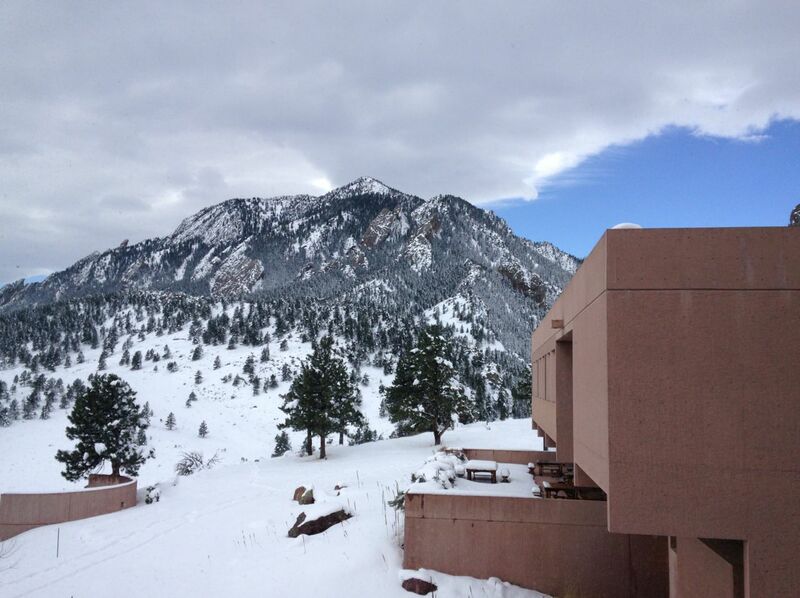 If you are in (or can get to) Boulder April 4th-8th, 2016, we'd love to host you at NCAR. This year's theme is Data Science. Apply for a student scholarship to attend. 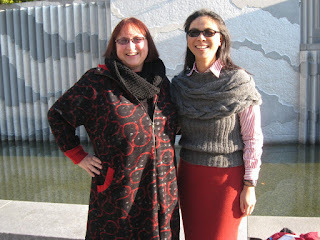 * Mary is the lead software engineer for the visualization group and I am the education and outreach lead for the data support group. 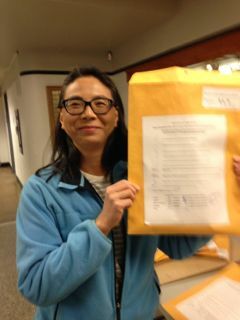 and I was elected to precinct caucus chair! First, caucus goers went into the Boulder HS auditorium to hear representatives talk up their candidates, including down-ticket races. Then, the more experienced caucus captains holding the precinct number signs led their precinct to individual classrooms (which we set up in advance) for more caucusing. I was late getting to the auditorium so I sat up in the balcony w/o our precinct sign. In advance, I volunteered to be caucus precinct secretary and a guy volunteered to be the caucus chair*. I attended caucus leader training to learn more about the process. I showed up at Boulder HS at 5:30 as instructed, collected my precinct materials, registered for my white voter/caucus slip, found my classroom and set it up. At 6:30, there was still no sign of the other guy. I called his cell phone. It went to voicemail. He left voicemail a few minutes later saying he was on his way. !?! After we were dismissed from the auditorium (around 7:15), I helped people find their way to their precinct classrooms and found about 2 dozen people seated in our classroom (Calculus BC, plastered with math joke posters, yay) when I returned. I followed the script, which told leaders to go around the room and have everyone introduce themselves and approximately where they lived. I was worried that would take too long by the time every (35) seat had filled up, but people kept streaming in. We gave up introducing ourselves when we had nearly 50 people in the room. It was 7:40 and there was still no sign of the guy who volunteered to be our precinct caucus chair. I told the room that my only qualification to lead a caucus was that I had taken the class. They proclaimed me the caucus chair. One young man volunteered to help as the caucus secretary and off we went. I passed around a clipboard and asked people to sign up to speak on behalf of their candidates. Several spoke on behalf of Sanders and one spoke on behalf of Clinton. Then it was time for voting, which has two steps, for the presidential race. First, we needed to take a non-binding threshold vote to determine which choices would be available for the binding second vote: uncommitted, Clinton or Sanders. To be included in the binding vote, a choice had to reach a 15% threshold. We counted off heads and got to 102. One voted for uncommitted, 15 voted for Clinton. That would have rounded up to 15%, but more people kept streaming in. People at the door offered to count the number of people who were streaming in and their preferences so we could add them to the count. We topped out at 125 in the end with 16 for Clinton. Late-comers, who had braved the lines for hours, went overwhelmingly for Sanders while the earlier crowd was less so. Both uncommitted and Clinton missed the 15% threshold. Only Sanders was on the binding preference vote and we gave him our 3 delegates by proclamation. I heard that happened at several precincts at our central Boulder super-site. I announced we were going on to the down-ballot races and let people leave. About half did. Our precinct is in HD 10, which has a contested race between two highly qualified Dem candidates. My goal was to allocate the 3 presidential delegates for our precinct fairly and accurately according to precinct sentiment, and then to get both HD 10 candidates qualified for the primary ballot. Several people spoke on behalf of one candidate for HD 10. None spoke for the other one. To qualify for the ballot, each candidate needs to get 15% or more of the votes at the caucus. At first, only one met the 15% threshold, with many abstainers. But then some people switched their votes to help get both on the ballot. Then we can make our final decision on the Dem HD 10 candidate, after we have time to get to know both candidates and their positions/differences better. Our precinct did not spend any time on the party platform. I had a paper copy and a form for us to suggest changes. Both the youth and senior vote went for Sanders at our precinct caucus. I knew most of the seniors who attended because they came from my condo complex. However, the Clinton supporters from my condo, for the most part, did not come to the caucus. I would have driven them had I not needed to arrive two hours before the caucus. A total of 121,596 Democrats registered at caucuses across Colorado, an increase of 1 percent over the 2008 attendance, according to the Colorado Democratic Party. But some precincts were inundated with as many as three times more people than expected. 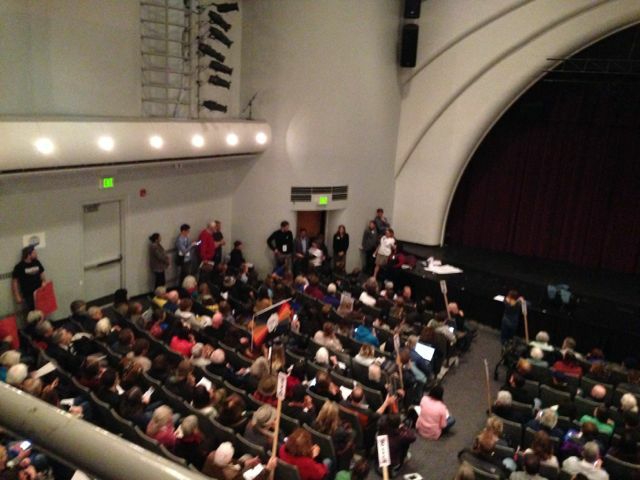 A crowd stretching four blocks from a Boulder Democratic caucus site became disillusioned Tuesday night as hundreds of people were turned away because of overcrowding. I attended my first caucus. I led my first caucus. I am not sure the people who were able to either arrive hours early or stood for hours in line, are representative of the electorate. I recall (though my recall might not be perfect) only 4 non-white caucus-goers in my precinct. This is Boulder, but I was surprised by the whiteness and the youth of the crowd. I'm with the 137 who would like to go back to a presidential primary so that more people's voices can be heard. However, with the funding (and hence spending) limitations of TABOR, the state switched to the caucus system to save money. The state pays for elections. Volunteers run the caucuses. This cost-transfer (5 hours of my time Tuesday night plus 2 hours for training) gives us a semblance of democracy. But, I worry that the caucus system gives the sentiment of a very narrow slice (~10%) of the electorate. * The guy who volunteered in advance to lead our caucus came in the door at 8:30 (3 hours late! ), just in time to cast his vote for Sanders.